This Japanese RPG is set in a Western fantasy setting that sees goblins, elves and all sorts of magical nasties populate this Dungeons & Dragons type universe. With the company behind the popular Dynasty Warriors behind Trinity: Souls of Zill O’ll , you are already guaranteed a hack 'n slash festival of epic proportions and this game delivers this strongly. Interestingly enough, this game is actually the sequel to the PlayStation 2 game Zill 'Oll Infinite but thankfully you don't need any prior knowledge of this title to enjoy Trinity, a back to basics RPG title. As a prequel to the original PlayStation 2 game, the story is a little confusing that uses cutscenes and stills to progress the tale of a clichéd good versus evil storyline with an interesting prophecy thrown in for good measures. According to the prophecy, the nefarious Emperor Balor of the Dyneskal Empire will be slain by his grandson and does a villainous act what all good tyrants would do... he orders the murder of those family members who could carry out this prophecy. However as fate intervenes, the child is spared as we fast forward to the "present", 20 years later. 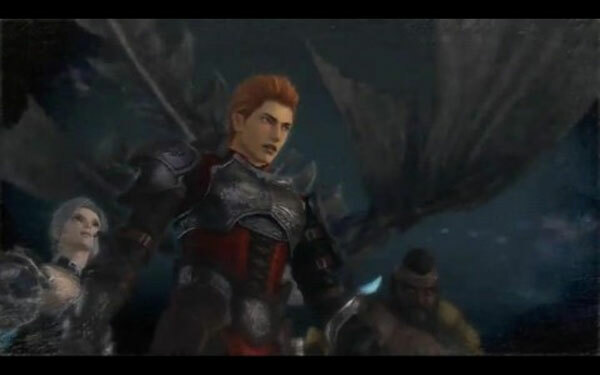 This is where the player comes into the mix as he controls Areus, the grandson of Balor and by completing quests and searching for new allies, he will hopefully have the strength needed to defeat him. In relation to the story, it does seem little all over the place with its flashbacks and limited information given the player. This unfortunately is a slight drawback to the game but fortunately the sturdy gaming engine is actually quite decent for an RPG. 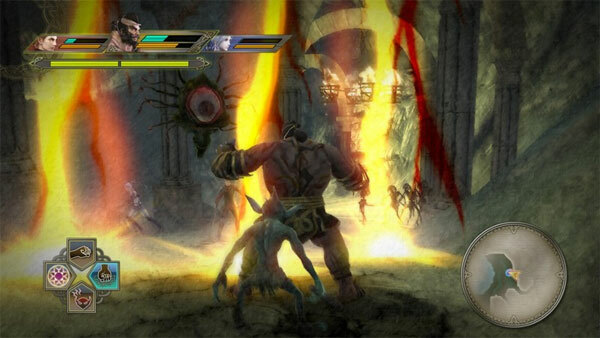 As Trinity starts quite slow, it begins quite interestingly as the player is thrown into the final fight with Balor and this section of the game acts as a tutorial. This teaches you the basics of the game and before you know it, you are thrust back in time again as Areus fights as a gladiator. Your gladiator fighting serves as another tutorial as does your first mission which is given to you at the Adventure's Guild as you travel throughout the lands. Apart from controlling Areus, Trinity allows you to swap between characters which does help brighten the game up a little. At it's core, Trinity is a traditional hack 'n slash role-playing game that does require quite a bit of button mashing when you face your foes. Thankfully not all your attacks are melee and your characters have access to magic and some very impressive weaponry. As you progress through the game, your characters are awarded experience which then allows you to fine tune your characters. It should also be mentioned that Trinity: Souls of Zill O’ll is not a free roaming RPG title but rather gives the player access to a world map that allows them to travel from various towns to mission locations. Once you have reached your mission location, it may contain a variety of different levels which require you to explore and thankfully there is a real-time map to assist. Items and weapons can be found during the missions or purchased at the various stores located throughout the lands of Vyashion. It's a little strange that the game is not a free roaming RPG but it actually helps in keeping things contained and focused. 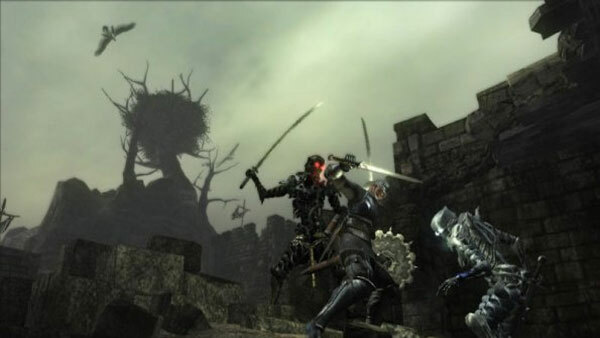 Combat is to the key to Trinity and even though the game implores a traditional hack 'n slash system, there is some strategy and tactics available to the player. Add in the ability to perform combinations, spells and some nifty quick-time events and everything comes together rather competently for this title. The boss battles are definitely the highlights of this game and can be quite difficult. Trinity offers two levels of difficult, an easy mode and a normal mode for starters. Easy is a little too easy and normal feels just right without it becoming too frustrating. One feature with the boss battles is that when your foe is weakened, a red arcane circle will be displayed which allows you to increase your damage. You can also call upon the powers of all three of your characters to unleash a deadly attack in unison. Swapping between characters is done via the shoulder buttons that does add another element of strategy into the game as each character has different abilities, it's actually fun exploring the game with them and "levelling" up. 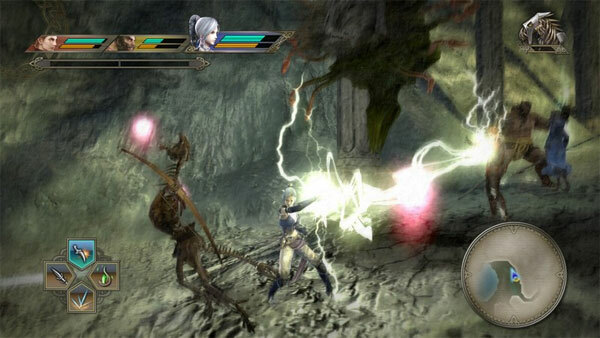 It's also fun to fight in the Arena in Trinity that gives the player a break from traditional grinding during missions. The AI of your party members are ok but for the majority of time, you will be forced to relay on your own skills to get through a mission. 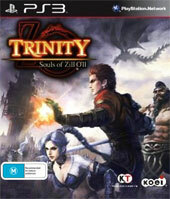 Graphically, Trinity: Souls of Zill O’ll is a little dated when compared to Western RPG's. The cutscenes look great and have this strange almost painting like appearance. 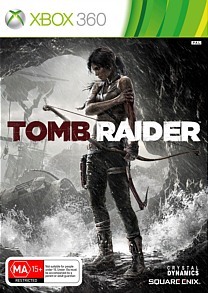 In-game graphics range from mediocre to good and many of the levels are quite Spartan at times. Animation is the game is decent as are the various character models that you encounter, especially some of the larger bosses. Although the environment is 3D while you are playing a mission, one shortfall of the game is the sometimes fiddle some camera angles. You do have control of the camera but when you're in the middle of a fight, your coordination will be tested as you attempt to turn the camera angle around. As the game is littered with cinemas, one issue I had with Trinity is that there are way too many cutscenes with only still images used. Just like the Final Fantasy and Metal Gear Solid, some of these cutscenes with text go on forever and I often found myself either skimming them or bypassing them complete. Even worse, some of these lifeless cutscenes have no voice acting. The scenes that do have the voice acting seem a little comedic at times, probably due to the fact of the over the top acting by the actors involved. Don't get me wrong, some of it is quite professional but at times, it feels like you've fallen into a Capcom game. Music on the other hand is amazing, thanks to its haunting melodies from instruments to voices which suits the genre perfectly. Even though Trinity: Souls of Zill O’ll had its short falls, I think I was in desperate need for an RPG. I actually enjoyed the game in this twisted old school way that may not have pushed the boundaries of this genre but rather, provided a relatively enjoyable experience from start to finish. There's quite a bit of hack 'n slash involved in this game, more specifically button mashing and your goals are quite clear, explore this dungeon, explore this forest and do something. This does remove the sometimes annoying random encounter as you travel from point A to B but I actually enjoyed it, even though it would have been nice to explore this intricate world. At the end of the day, Trinity: Souls of Zill O’ll actually works and is a competent RPG.